2015-16 Upper Deck MVP Hockey is the first release of the new season and continues its run as a budget option for collectors. Each box promises a multitude of parallels, inserts and short prints, as well as one hit. 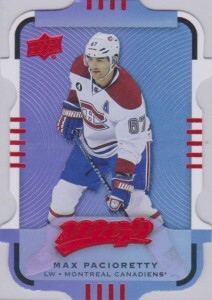 The base set for 2015-16 Upper Deck MVP Hockey consists of 250 cards, including 50 NHL Territories Light F/X subset cards that fall three per box. There are also another 100 High Series SPs that are found one per pack and offer a compelling, but manageable, option for set collectors. Rookie players are the focus for 25 of the short prints. Several base parallels add further depth to the base set. Silver Scripts fall roughly 1:3 packs while Super Scripts (#/25) are a box hit. The Colors & Contours parallel is a rainbow foil die-cut that features nine tiers of rarity, including Teal, Gold and Purple, and averages six cards per box. Each 2015-16 Upper Deck MVP Hockey box yields one hit that could be an autograph, relic card, Super Script parallel, Rookie Redemption or printing plate. 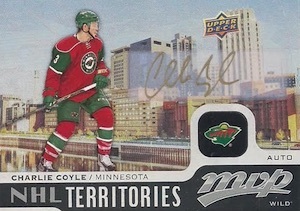 Among the autographs and memorabilia options, there is an NHL Territories Jersey (1:75 packs) and Autograph (1:320 packs) parallel. Pro Sign Autographs (1:225 packs) and dual-signed One-on-One Signatures (1:3,600 packs) offer additional autograph possibilities. Focusing on the newest players, four different Rookie Redemption cards (1 per case) can be redeemed for an 8-card set that is broken down by division. 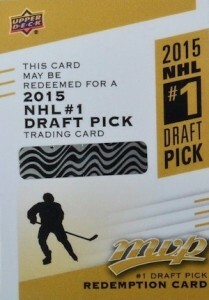 Lastly, 2015 NHL Draft #1 Pick Redemptions (1:960 pack) offer collectors the first NHL-licensed card for the newest number-one pick. There is also a limited signed parallel that is found at 1:9,600 packs. UPDATE: MVP is also part of the e-Pack program and available now. In addition to a chance at pulling a variety of inserts and parallels, collectors can combine 20 digital base cards (#1-200) of one subject to receive an exclusive Green parallel that is a physical copy. Overall Odds - 1:4 h; Individual tier pack odds noted below. Overall odds - 1:320 h; Individual group packs odds noted below. Overall odds - 1:75 h, 1:750 b, 1:750 r; Individual group pack odds noted below. Overall odds - 1:3,600 h; Individual group pack odds noted below. Overall odds - 1:225 h; Individual group pack odds noted below. I just wanna say that I was really looking forward to this product seeing the checklist and all the possible inserts and rookies and stuff, so I bought a box sat august 8th,(50$ Canadian) I was looking for a blaster or hobby box, all I could find was a retail 36 pack box, figuring that there are more than the standard 24 pack box. boy was I wrong. 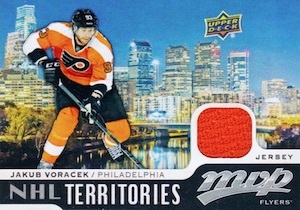 2 territory inserts, (Roy and Damphousse). where’s anything , talk about a box of commons! So as you can tell, I was very disapointed with this, Hell I bought a score box for 20 bucks and it had much more bang to it,(and we are talking Score here), so correct me if I am wrong but is that not the Worst box ever!!! is there anyone I can complain to about this? (like upperdeck or something). Avoid like the plague!!! Really tough to knock this product at the price point. opened 5 hobby boxes at 45$ each (why waste your time with the retail?) pulled some great colors an contours…. lots of nice silver scripts. a reider pro sign auto… a ladd superscirpt.. an ekblad jersey, a shore printing plate and the macdavid rookie redepmtion. can’t ask for a more fun product for the price point. and Redemptions with almost impossible odds (see my text). Again, if I’m not wrong, there’s no wonder you pulled what you pulled. My advice is to check exactly what comes in a retail box and what comes in a hobby. If I’m wrong about this, please, someone correct me. THIS IS NOT A SET FOR SET BUILDERS. STOP REFERRING TO IT AS SUCH. I bought a $20 blaster. I pulled a complete 1-100 base set, 12 of the SP from 101-200 (only 3 RC), and ZERO of the cards from 201-250. Just because something is cheap doesn’t automatically qualify it as a set builders set. Just because 5 people might actually complete a set doesn’t make it a set builders set either. And before anybody comes back and tells me I can purchase the 138 cards I’m missing on ebay, then let me ask you then how does this remain a low end set with that kind of expense added in? I just want to reiterate, I know the difference of retail and hobby, and blaster and fat packs, first of all I bought it because it was my only option, because, I love hobby boxes, and they only had retail, second off I know of the futility of retail, but even in the past I have got much more with retail boxes of Upper deck, Pacific Prizm , Donruss or even Score (mainly bought at target and Walmart in the past 5 years or so). So Yeah I am hoping that a hobby box will be much better! I bought a case of Hobby and this is what I pulled from the 16 boxes: 23 base 1-100 sets, 3 SP/RC sets between 101-200, and was missing 2 out of the 201-250 Territories cards. Got 2 ProSigns, 6 Territory Jerseys, 2 Territory autos, a plethora of C&C’s in all 9 levels, 4 Super Scripts #/25, 1 Stanley Cup Playoff, a #1 Rookie Redemption, a Division Redemption, and a 1on1 Dual Autograph (RNH&Hall). No Gold Scripts or Printing Plates. I opened 3 hobby boxes of this, I quite like the new Colors and Contours and the new Territories cards but their are some serious collation issues in this product. Out of 72 short print base I got only 32 of them were unique meaning over half were of them were repeats and I have less then 1/3 of them. On top of that 2 of the boxes were missing their hit card. I’ve seen some boxes have upwards of 3 hits and some with 0, I get that is a low end product but at least expecting to be farther along in the short prints at this point. Turns out that Upper Deck does not guarantee a “big hit” with every hobby box of this product…I love the way the cards look but I won’t be buying this or any other Upper Deck product anymore. I have been purchasing packs since the products has hit hobby store shelves and I am pretty happy with it. 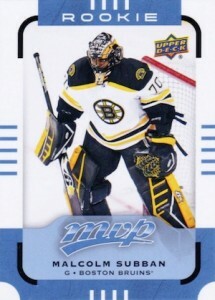 I am really waiting for Upper Deck Series 1 which becomes available in November but MVP helps with the wait. Last night I bought 14 packs and I pulled a ProSign Johnny Gaudreau Auto and loaded up on strong Rookie Cards. Of course the hunt is still on for Connor McDavid redemption card. Like O-Pee-Chee this product is a great product for young and/or novice hockey collectors. I like the idea of one hit per box for sure. I have opened three boxes and only pulled two major hits. My first two hits were the Torey Krug auto and the #1 draft pick redemption non-auto version. My third box yielded no hits that I can tell. It would be nice to better understand what UD defines as a major hit. Bought two hobby boxes with zero hits or rookie redemptions. But, since they aren’t guaranteed, not too upset. You pay for the fun of opening the first hockey cards of the season and that’s exactly what I got. Cheers! Well, obviously, I am going to rate it a 5 – not that the total is truly a 5, but I pulled the #1 Draft Pick AUTOGRAPH Redemption card for McDavid…it will be his first in an Oilers jersey, and I have only seen 4 others on Ebay (mine is 191676147733). I wonder what the actual number produced for this amazingly rare card is? anyone have any idea? I give 4 stars to this product. I opened 1 hobby cases. Checklist � It’s ok, but some teams are underrepresented (e.g. Arizona 1 player in the base checklist, one one in the SP checklist, Buffalo with very few players, etc. ), while other teams are overrepresented, such as NYR. I understand it’s a matter of hockey culture and some geographical areas are not as hot as others, but still. Also, I don’t understand why not all teams have at least one rookie. Sure, they may never make the team, but still, it would be fun to have at least one rookie per team. Design � Nice design, especially the Silver Scripts. The Territories are awesome. It’s good to have an idea of the city the teams play in. Inovations � I know people really like the Colours and Contours set, but personally I’m not very fond of it. 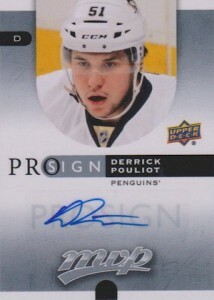 I’m more of a sobre hockey cards lover. Notable Pulls � 4 Super Scripts (Pelle Lindberg et al. ), 1 2015 Stanley Cup Final, 2 Pro Signs, 1 Printing Plate (Toews!! :) ), 5 Territories with Patch (Price and Ovi :) ), 1 with signature (Ekblad! ), 1 Pacific Redemption and YES, THE FIRST DRAFT PICK REDEMPTION (no auto though). I give it 4 stars because of the McDavid redemption I pulled. If not, for me, it’s a 3 stars product, mainly because UD guarantees no hit. For this kind of product there should be one in every box! gives a little valve to this product. Just opened a hobby box and I didn’t get the 1 “big hit” that I can see. Not too happy about that. All of the other cards where there I think but it’s really hard to tell. Picked up a $20.00 blaster at my local wal-mart and by far was the best break of my life. First pulled a Trouba auto, then a Bobby Orr auto, then a Gretzky auto. All in the same Blaster box!!! So, I just wanted to collect the Winnipeg Jets cards from this set (I think they look great) but just wondering something. On the back of the cards, it has the pronunciation of their names. On my Rookie Andrew Copp card, it has the pronunciation of Jean-Francois Berube (??). Is there greater value of a card with an error on it? Just curious. Thought it was funny such a short name had this big huge pronunciation. Weird. Not even a guy from that team. Anyone notice it before? Richard Harris, that’s retail for you.. Upper Deck calls their retail products as “set fillers”.. That’s why, when you see the odds on fat packs, they don’t have jerseys or autos.. Upper Deck has really ruined hockey cards that they’re not worth buying anymore.. I wish they’d kill off that hobby crap and sell in retail.. Does anybody know if what the redemptions expiration date is?